SBI PO Prelims Asked Questions updated on this page. Candidates can download the 30th April SBI PO Asked Questions & Answers for free. You may also check the official website www.sbi.co.in for more latest updates of the State Bank of India PO Preliminary Question Papers. You may also check the SBI PO Exam Analysis for all sections. State Bank of India conducting the SBI PO Preliminary Exam in various test centers successfully. The SBI scheduled the PO Exam on 29th April, 30th April, 6th May, and 7th May 2017. So, the applicants had downloaded their SBI PO Admit Card and verified their exam date in it. Here, we have provided the State Bank of India PO Prelims Asked Questions of Morning and Afternoon Shifts. So, candidates can download the Today’s SBI PO Question Papers for free. 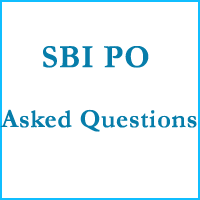 The direct links to get the SBI PO 30th April Asked Questions can be enclosed below. You may also refer the official website www.sbi.co.in for more latest updates of State Bank of India PO Prelims Exam. Download the SBI PO Prelims 30th April Question and Answers. The asked questions in reasoning, Quantitative Aptitude, and English are provided on this page. 01 Quantitative Aptitude 35 1 Hour Online (Computer Based Test). Check the following section for SBI PO Asked Questions of Reasoning, English, and Quantitative Aptitude subjects. Download the SBI PO 30th April Prelims Question Papers. 2. 25, 32, 21, 34, 17, ? 4. 4, 7, 35, 83, 146, ? A dealer sell two A and B article at 20% and 30% profit. Total profit earned by him is Rs. 140. Cost price of article A is 50 less than cost price if article B. Find the Cost Price of B. A, B and C started a business where their initial capital was in the ratio of 2:3:4. At the end of 6 months, A invested an amount such that his initial capital became equal to B’s initial capital investment. If the annual profit of B is Rs. 3000 then what is the total profit? Suman spend 36% on food. Remaining ¼ on brother and ⅜ on sister. The difference of amount given to brother and sister is 1200. What is sum and total savings? Blood Relation: M is the father if J, M is having 2 children’s J and T. Q is the brother in Law of J. Then How is T related to Q?